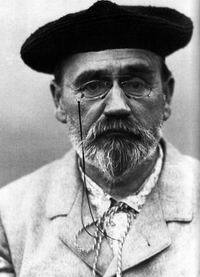 Birth of Émile Zola (1840-1902), French novelist. In 1898, Zola causes a sensation with the publication of J’accuse!, an open letter in which he accuses the French government of anti-Semitism for its persecution and jailing of Alfred Dreyfus, a French army officer imprisoned for allegedly engaging in espionage. In his letter, Zola points out the lack of serious evidence against Dreyfus, and glaring legal irregularities in the case. After his letter appears, Zola is convicted of libel, sentenced to prison, and removed from the Légion. He flees to England to avoid imprisonment. Dreyfus is eventually exonerated, 12 years after he was charged and imprisoned. Cree warriors attack the village of Frog Lake during the North-West Rebellion, killing nine settlers.